I love looking at the outfits celebrities wear, more often than not looking as though they were dressed in the dark. However, every now and then you get a flash of brilliance, and this book offers many a brilliant flash of fashion fab. When it's done properly, there's no escaping the elegant beauty on the page. Whether you're in your twenties or seventies, you can look your best. 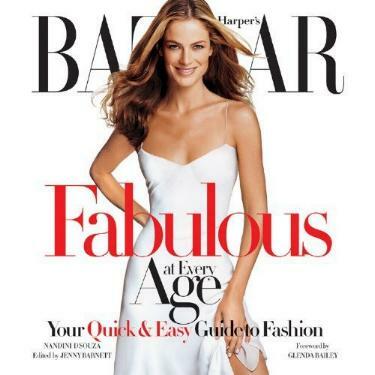 Harper's Bazaar's pages are full of edgy advice to look your most stunning, with accessories and colors and fabrics galore. This book covers The Perfect Wardrobe from 20 to 70+; Smart Shopping; How to Wear It: Tops; How to Wear It: Skirts; How to Wear It: Jackets & Coats; How to Wear It: Pants; How to Wear It: Dresses; How to Wear It: Evening; Best Extras; Beach Guide; Closet Essentials, and The Last Word which covers everything. The Best Extras chapter covers shoes, bags, scarves, belts, and jewelry. You're bound to find something to help you make the most of your age and build when looking for a new wardrobe. There is so much to choose from it's staggering. Whether it's skirts or pants you prefer, blouses or dresses, shorts or evening dresses, it's all here, and you'll learn how to put together an outfit that's classy and chic. Some of my favorite and gorgeously put together ladies are these, age having nothing to do with it: page 15 Cate Blanchett; page 96 Jane Fonda; page 122 Michelle Obama, and page 141 Demi Moore. On the other hand, there are always some people in the limelight who wear outfits that make you think "What were they thinking!" These are my worst photos: page 11 Kirsten Dunst; page 59 Kim Raver; page 64 Miuccia Prada (WHAT! ); page 71 Clémence Poésy; page 90 Heidi Klum; page 106 Naomi Campbell, page 110 Julianne Moore; page 112 Madonna, and page 137 Jennifer Connolly. Visit the Harper's Bazaar website. Conclusion - A fantastic guide to looking good, filled with great advice for all ages.